Art from Chicago is always dear to my heart because it is my hometown. I lived there during the very fertile artistic period of the 1970s and 1980s. There were gallery openings every Friday night on Huron Street and Superior Street, then full of galleries representing up-and-coming artists. The artists who particularly intrigued me were those who came into their own in the late 1960s and early 1970s. One of those artists was Margaret Wharton. Art in Chicago in the early 1970s had a strong Pop Art flavor. The Chicago School, as it was called, had a strong contingent of women artists. The “school” was characterized in general by funky, vital, and surreal imagery. Subject matter often related to current events or surreal visions of everyday objects. The work of many of the artists, Wharton included, was related in spirit to the Dada movement in Europe of between ca. 1916 and 1922. Dada emphasized the irrational in art and the transformation of the commonplace into bizarre, monumental works of art. Wharton was trained at the School of the Art Institute of Chicago. Many of her teachers were active in the Chicago School, and they encouraged her highly personal vision. In 1973 she helped found the Artemisia Gallery, the first cooperative gallery for women artists in Chicago. Her earliest works were welded articles of clothing, influenced by the plaster works of Claes Oldenburg (born 1929). She also created small, enigmatic boxes reminiscent of the work of Surrealist Joseph Cornell (1903–1972). She turned to the chair as a primary subject matter for some years beginning in 1975. 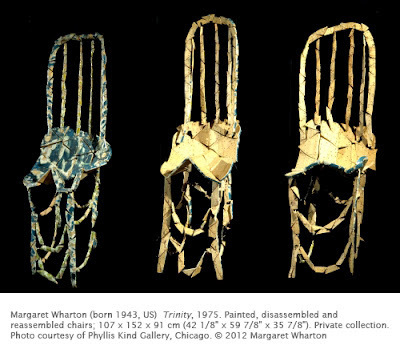 While many Dada artists and 1960s artists had used chairs as a starting point and added to them, Wharton made sculptures only out of chairs. She sliced, cut, chopped, and deconstructed them, creating new and evocative forms. The titles were often suggestive of religious subjects, such as this piece. To make Trinity, Wharton cut three chairs into segments and recombined them in limp form, belying their function. The limp nature was perhaps meant to signify the impotence of organized religion. The chair conveys a strong human presence, and no matter what transformation Wharton enacted on chairs, the object never completely strayed from its original form. Her work transcended found object works in that she transformed an everyday objects into sculpture with totemic impact. Currently, Wharton’s work consists of sculptures created from a variety of found object. She continues to use chair parts in her work. Check out her latest work at her gallery representative: Jean Albano Gallery. Studio activity: Design a non-functional chair. Using markers, crayons or colored pencils, design a chair that would be a work of art rather than a chair in which to sit. Be sure to include details such as attached objects, the shape of the members of the chair (arms, legs, back, seat), and the colors of the design.